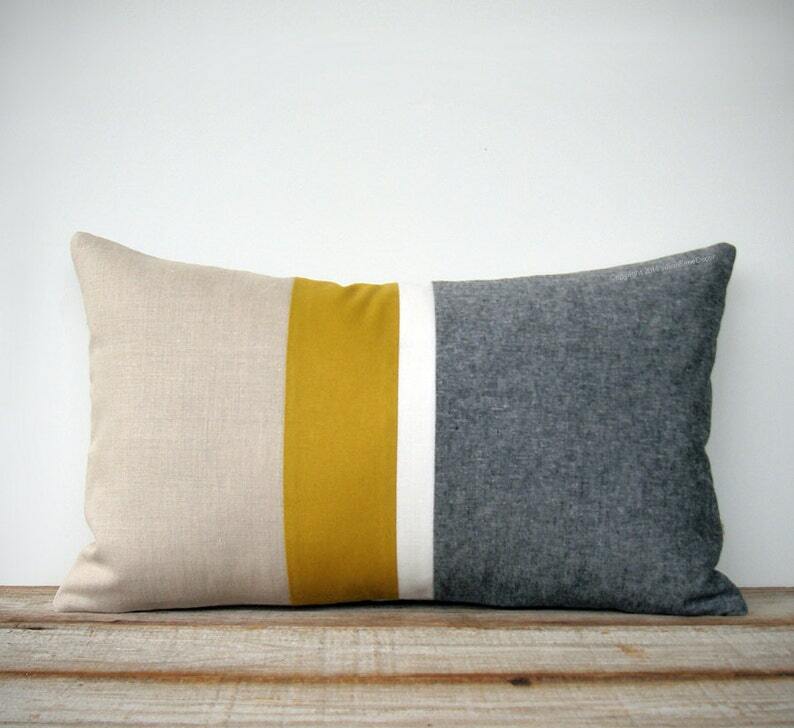 NEW DESIGN :: Colorblock stripes in your choice of (blue, gray or black chambray), off white, mustard yellow and natural linen gives this pillow cover layers of texture and a pop of color. One of the HOTTEST color trends! 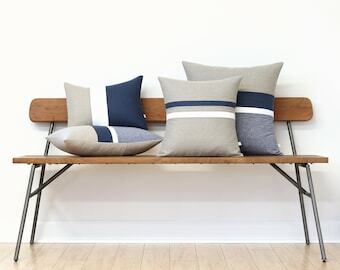 This color palette and design coordinates perfectly with our signature colorblock pillows. 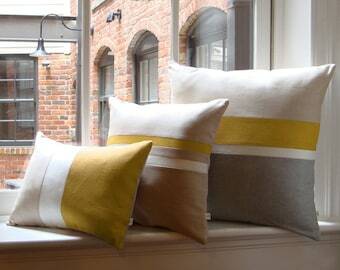 Makes the perfect accent on a chair, sofa, window seat or bed. It would also make a perfect housewarming gift too! 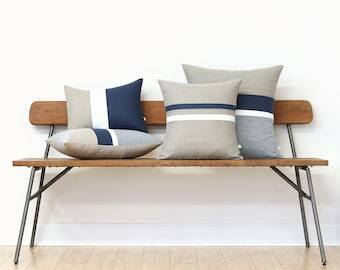 Pillow Cover: 12" x 20" or 20" x 20"
- Front: your choice of (blue, gray or black chambray), off white, mustard and natural linen. - Body: natural linen with envelope closure. - Cream tag with neutral JillianReneDecor logo. - Pillow: machine sewn, double stitched, finished edges and fully lined with envelope closure. - Care Instructions: spot clean, hand wash, lay flat to dry. I take great pride in my work. I only use high quality materials and I implement meticulous craftsmanship. Need it sooner? Please contact me - I will do my best to accommodate your request. If you can't find the exact color or size you're looking for... I gladly accept custom orders. JillianReneDecor™ Copyright 2014- 2019. All rights reserved. Beautiful! Quality is great. Well packaged. Just lovely. Beautiful, just as pictured, would highly recommend. Payments must be received within 7 business days following your purchase. All forms of payment must be received and cleared prior to shipment. Virginia residents are required to pay VA Sales Tax. If for some reason you decide to cancel your order, please contact us within 24 hours of your purchase. Exchanges will ONLY be processed within 30 days of the date of purchase. **CUSTOM ORDERS require full payment and are non-refundable. **RUSH ORDERS require full payment and are non-refundable. **All items must be returned unused and in their original condition with tags attached in order for a refund or exchange to be processed, less shipping. In the unlikely case that damage occurs during shipment, please return the entire package in order to receive a full refund or process an exchange. If damage occurs during delivery, we will be happy to try and attempt to recreate the original piece. However, many of our pieces are one of a kind and recreating may not be possible. US Shipping: Monday - Friday via USPS Priority Mail or FedEx Home Delivery. **Payment must be received and cleared prior to shipment. No exceptions. **Please inform me of all special shipping requests at the time of purchase. Expedited shipping, upgraded shipping, and insurance is available upon request. (additional fees apply) Please contact me for more details. **CUSTOMS or DUTY FEES on US parcels may be charged by your country of residence upon delivery. Unfortunately, we have no control over such fees and they vary dramatically - please check with your local post office before ordering if you have concerns. By law, we are required to mark international parcels as 'merchandise' and and are required to claim the actual retail value on the customs form. Your item(s) will arrive neatly packaged, perfect for gift giving. **If your purchase is a gift, to be sent directly to the recipient, please outline instructions at the time of purchase. **All efforts and precautions are taken to ensure a safe and undamaged delivery. In order to verify fabric colors, samples may be requested if available (fees apply). If you would like to make a special request, I'm up for the challenge! **Special terms and charges may apply. Please contact me so that we can discuss the details. Please don't hesitate to contact me if you have any questions or comments! All artwork, images and content © 2012-2019 JillianReneDecor. All rights reserved. Can I order a custom size or color? Yes. 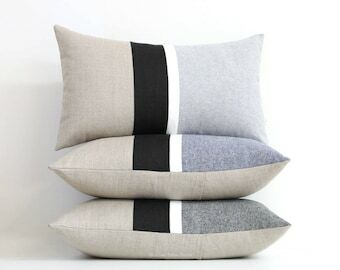 We specialize in custom pillows! Send us a message and let us know what you have in mind. 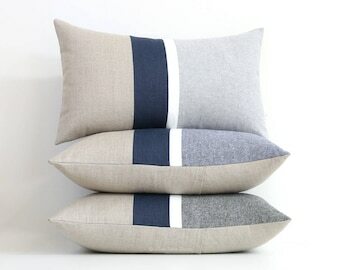 Can you help me choose a set of pillows for my room? Absolutely! Jillian earned a BFA in Interior Design from VCU's School of the Arts, the #1 public art school in the United States. Send her a message with photos of the space and what you have in mind and she'll put together the perfect set for you. She's wonderful to work with - please see our shop reviews for customer feedback. We're known for our stellar customer service! Yes. Interior Designers and Architects, please contact us for more details or use the link below. Documentation required. Yes. Please contact us for more details or use the link below. Documentation required.